A month after being granted U.S. patent No. 7,441,196, a company in Los Angeles called EMG Technology is suing Apple for “the way the iPhone navigates the Internet,” according to a press release. The suit did not specify the damages EMG is seeking, but the company has hired a serious gun: Stanley Gibson, one of the lead trial attorneys who won the $1.35 billion patent infringement lawsuit against Medtronic. One of the patent’s inventors is Elliot Gottfurcht, who is best known as a Los Angeles real estate developer. The patent covers methods for reformatting Web pages onto TVs and mobile devices, as well as for manipulating those Web pages using zooming and scrolling techniques. The suit is specifically targeting the touch-screen browser on the iPhone, but it could just as easily apply to any mobile browser, including the one on the Android phone. The name of the patent is “Apparatus and method of manipulating a region on a wireless device screen for viewing, zooming and scrolling internet content.” It was filed on March 13, 2006. At first glance, portions of it seem quite broad and quite obvious. Mobile browsers have been reformatting Web pages going back more than a decade. And the thrust of the patent seems to be focused on interactive television. But it looks like Apple has yet another patent lawsuit to contend with. (Now would be a good time for those guys at Rational Patent to try to sell Apple on its patent protection service). Here are some of the claims in question. 1. 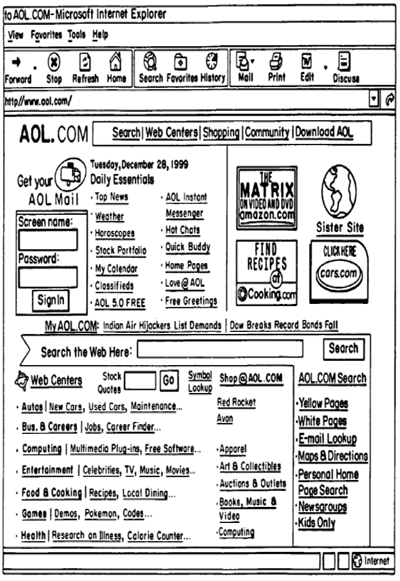 A method of navigating the Internet, comprising: displaying on-line content accessed via the Internet, the on-line content reformatted from a webpage in a hypertext markup language (HTML) format into an extensible markup language (XML) format to generate a sister site, the sister site including a portion or a whole of content of the web page reformatted to be displayed and navigable through a simplified navigation interface on any one of a television, web appliance, console device, handheld device, wireless device or cellular phone, the simplified navigation interface displayed in a form of a two-dimensional layer of cells from a plurality of layers and a plurality of cells, the two-dimensional layer in a form of a navigation matrix, each cell is a division of a screen and exclusive to a separate single navigation option associated with a specific unique input, the on-line content formatted to be displayed in one or more of the plurality of cells and formatted to be selected for navigation by one or more of the unique inputs, navigation options to change between layers of the simplified navigation interface from general to more specific in each deeper layer; receiving a user selection of one of the navigation options; forwarding the selected navigation option across the internet to a server providing the simplified navigation interface; receiving a next deeper navigation layer of the simplified navigation interface corresponding to the selected navigation option; and manipulating a region of the screen for viewing and zooming and/or scrolling of the displayed on-line content. 6. The method of claim 1, wherein the screen includes individual regions adapted to be brought into focus and further adapted such that the on-line content can be manipulated within a selected one of the regions. 7. The method of claim 6, further comprising tabbing to focus on different one of the regions. 8. The method of claim 6, wherein the focused one of the regions is adapted to be zoomed and/or scrolled independently of other ones of the regions.